China, now the second largest economy in the world, has been trying to liberalize its financial markets and adopt a more open and competitive environment for investors. Both stock and bond markets in China developed rapidly in the past twenty years, and played a significant role in its impressive GDP growth. The country’s financial markets are deepening, foreign investment keeps pouring in, and capital is flowing outward. Yet a long-closed economy—even one with more than $3 trillion in foreign reserves—can’t swing open its doors overnight. China’s domestic financial markets will have to deepen and develop further, and become more effective and efficient. At the same time, its relative isolated market with barriers that prevent free capital flow will have to diminish gradually, and the country must win the trust of global investors. Continued reform in China, coupled with its connection with Hong Kong, an established international financial center with a close cultural and geographical tie with China, could make the country one of the world’s most influential players of capital in the years ahead. 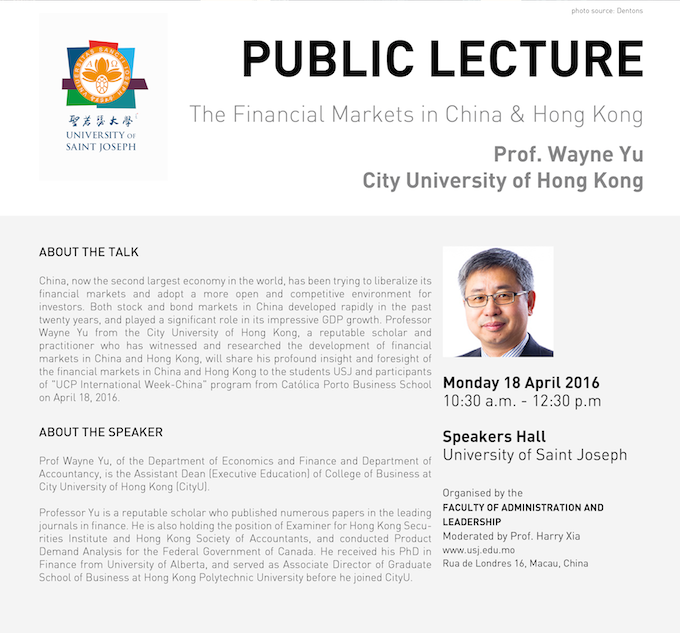 Professor Wayne Yu from the City University of Hong Kong, a reputable scholar and practitioner who has witnessed and researched the development of financial markets in China and Hong Kong, will share his profound insight and foresight of the financial markets in China and Hong Kong to the students USJ and participants of “UCP International Week-China” program from Católica Porto Business School on April 18, 2016. Prof Wayne Yu, of the Department of Economics and Finance and Department of Accountancy, is the Assistant Dean (Executive Education) of College of Business at City University of Hong Kong (CityU). Professor Yu is a reputable scholar who published numerous papers in the leading journals in finance. He is also holding the position of Examiner for Hong Kong Securities Institute and Hong Kong Society of Accountants, and conducted Product Demand Analysis for the Federal Government of Canada. He received his PhD in Finance from University of Alberta, and served as Associate Director of Graduate School of Business at Hong Kong Polytechnic University before he joined CityU. Morck, B. Yeung, and W. Yu (2013), “R Squared and the Economy”, Annual Review of Financial Economics, 143-166. Tong and W. Yu (2012), “A Corporate Governance Explanation of the A-B Share Discount in China”, Journal of International Money and Finance, 125-147. Lui, J. Wang, and W. Yu (2010), “The Predictive Power of the Implied Volatility of Options Traded OTC and on Exchanges”, Journal of Banking and Finance, 1-11. Johnson and W. Yu (2004), “An Analysis of the Use of Derivatives by the Canadian Mutual Fund Industry”, Journal of International Money and Finance, 947-970. Chen, V. Mehrotra, R. Sivakumar, and W. Yu (2001), “Layoffs, Shareholders’ Wealth, and Corporate Performance”, Journal of Empirical Finance, 171-199. Morck, B. Yeung, and W. Yu (2000), “The Information Content of Stock Markets: Why Do Emerging Markets Have Synchronous Stock Price Movements?”, Journal of Financial Economics, 215-260.